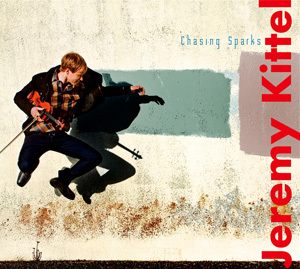 Jeremy Kittel has released a new CD, Chasing Sparks (Compass Records). With the drive of Celtic fiddling, the spontaneity of jazz, the soul of bluegrass, the rhythms of Africa and Latin America, the layered melodies of Eastern Europe, and the intricacies of chamber music, fiddler Jeremy Kittel consistently captivates audiences. On Chasing Sparks, Kittel, a US National Scottish Fiddle Champion and winner of six Detroit Music Awards, leads an exceptional band whose musical roots transverse the world. Members of the band include guitarist Kyle Sanna, World Music Award-winning percussionist Bodek Janke, bassist Andrew Kratzat and cellist Tristan Clarridge. You may listen to some of the clips from this latest release on our website, and read more about Jeremy by clicking here.